Reference number for this case: 21-oct-54-Pouzou. Thank you for including this reference number in any correspondence with me regarding this case. Headlining "Picoti, picota...", something like "tickle tickle", many French newspapers for October 22 and 23, 1954, reported that a motorist from Cherbonnières who was driving on the road to "Souzou" - actually Pouzou, in the Charente-Maritime, with his 3-year-old son, felt tingling like electric shocks all over his body as his car advanced. The child, who apparently felt the same discomfort, began to cry. Soon the engine stopped, the headlights went out, and at the same time a sharp glow changing color from bright red to the orange blinded the motorist who however distinguished a craft "motionless in the space" for a few moments. The craft "disappeared soon", and immediately after, the driver was able to restart the engine of his car. The very "skeptical" ufologists Gérard Barthel and Jacques Brucker, in 1979 - when the case had been republished in many ufological books and journals and dated October 21, 1954 - assured that the case has been "distorted." They say the son was 4-years-old, they change Cherbonnières to Charbonnières. Giving the same narrative as the Press, they then said that almost nothing corresponds to what the witness told them: the latter said the stall, and the feeling of minimal heat that he felt, were due to the emotion and surprise at the passage of a phenomenon that he described as brief, very fast, a luminous body with a slight trail. The case continued to be presented without mentioning the words of Barthel and Brucker by a very large number of French and foreign sources. A motorist of Cherbonnières was driving along the road from Souzou together with his 3-year-old son, when he felt pricklings all over his body, feeling like electrical sparks, which became more pronounced as his car moved onward. The child, who felt the same symptoms, began to cry. Presently the motor of the car stopped and the headlights went out. At this moment, the motorist saw a brilliant light changing from bright red to orange. Though blinded by it, he could make out a machine hovering motionless in midair, which after a few moments disappeared. Immediately thereafter, the driver was able to start his engine. Jimmy Guieu indicates that on October 21, 1954 in the area of La Rochelle, a motorist of Cherbonnières drove on the road of Souzou with his 3-year-old son when he felt prickling on the body similar to electric discharges which were increasing as the car advanced. The child felt the same faintness and started to cry. Soon the engine stopped and the headlights died out, and at this very time a sharp gleam was seen, passing from the sharp red to the orange color. The motorist was dazzled but however distinguished a circular craft during a few moments before it flew away. As soon as the machine disappeared the faintness of the driver ceased and he was able to restart the car's engine. Aimé Michel indicates that on October 21, 1954, a motorist who drove with his three year old son on the road Inter Communale I.C. 20 close to Pouzou, a village near La Rochelle, suddenly felt an impression of increasing heat and electrification of all his body. The child started to cry, as he experiences the same symptoms. The car's engine stalled and the headlights died out. At the same time, a machine which had first appeared to them as dark appeared in front of them, almost instantly became luminous, sharp red, then orange, and then flew away at high speed. The symptoms disappeared then. The author indicates that on October 21, 1954 in Charente-Maritime, an inhabitant of La Rochelle and his three year old son, "Car. Craft stopped on the road, initially dark then luminous. Witness feeling heat and electrification. Stalled engine. Extinct headlights. (M. II, p.341)." A man and his four-year-old son, coming from Charbonnières, suddenly felt painful tingling, similar to those produced by an electric shock; the child began to cry. The intensity of the pain increased as the car moved on, until the engine stopped suddenly and the lights went out. They were blinded by a powerful red light that turned orange; it emanated from an object that moved over the road. 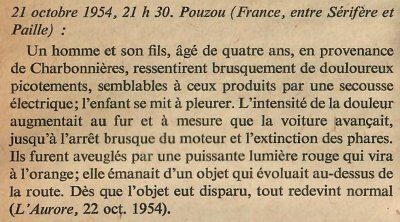 As soon as the object had disappeared, everything returned to normal (L'Aurore, 22 oct. 1954). A man and his son felt unpleasant tingling like electric shocks of increasing intensity. Then the engine of their car stalled and the headlights went out. A dark object on the road then lit up and took off. The case of Pouzou allows us to introduce another type of phenomena sometimes related to "paralysis". These are motor vehicle stopping (cars, trucks, mopeds...) with or without the extinction of the headlights. These testimonies tend to prove that electrical phenomena would be involved. All "paralyzed" motorists saw, without exception, their vehicle immobilized. But the opposite is not true and many vehicles were stopped without their driver being deprived of movement (Pouzou for example). All this shows that the occupants of "Flying Saucers" have an absolute respect for human life. Suffice it to think about what would happen if a motorist was suddenly "paralyzed" at the wheel of his vehicle launched at 100 km / h. Any comment seems superfluous. 22. October 21, 1954; near La Rochelle, France. Motorist and child felt shock and heat, motor and headlights failed; then luminous UFO became visible ahead of car. 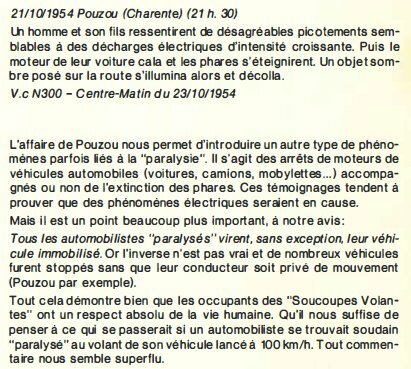 Jacques Vallée indicates that on October 21, 1954, in the department of Charente, a man from Cherbonnieres was driving his car toward Pouzou. With him was his three-year-old son. Suddenly he felt prickling all over his body, similar to electric discharges; this painful feeling became more intense as the car kept going. Soon the child started to cry and, as the car proceeded, the engine died and so did the headlights. At the same time the witness noticed a bright, glowing red color changing to orange, soon becoming of a blinding intensity. For a few seconds he saw an object hovering; it disappeared soon afterward. He was then able to start his engine again. The author indicates that in the night of October 21, 1954, a motorist and his three-year-old son were driving in the vicinity of La Rochelle, near Pouzou, when the child began to cry. At the same instant the driver felt an electric shock and increasing heat pass through his body. The engine stopped and the lights went out, revealing a glowing object on the road directly ahead, which until then had been invisible. Instantly the thing became brilliantly luminous, first bright red, then orange as it took to the air. Everything then returned to normal. N° 153. October 21. 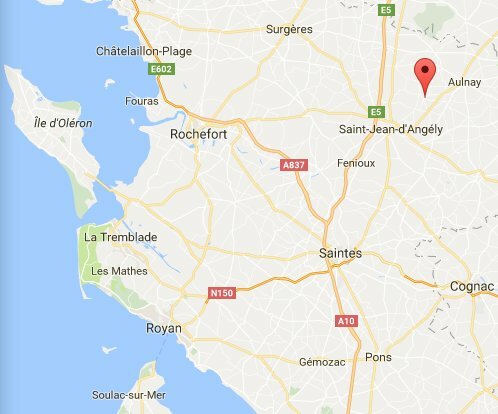 Pouzou: a man of Cherbonnières, who had with him his 3-year-old child in his car, is seized with painful tickling similar to electric shocks. It is more and more painful as the car moves on; suddenly the engine stops, the headlights go off and the child starts to cry. They are blinded by a strong red light that changes to the orange color. It came from an object hovering on th road. The object flies away fast. Oct. 21, 1954, 09:30 P.M., Pouzou (France). Between Serifere and Paille, a man from Cherbonnieres suddenly felt painful prickling similar to electric shocks and his 4-year-old child started crying. They felt increasing pain as the car went on, and suddenly the engine died and the lights went off. They were blinded by a strong red light, which turned orange. It came from an object hovering above the road, and everything returned to normal when it went away. (L'Aurore, 22 oct 1954) (80; M 341). In a list of 1954 Frenc case that need to be reinvestigated, the magazine noted the case "21-10-54 Pouzou, between Sérifère amd Paille". The two authors indicate that in Les Eglises d'Argenteuil in the Charente-Maritime, on October 21, 1954 at 09:30 p.m., a motorist and his three years old son which came from Cherbonnières drove on the departmental road D220. Near Pouzou, they felt tickling on the body, similar to electric discharges which were accentuated as the vehicle advanced. The child started to cry. The engine of the car stopped and the headlights died out. At the same time, a sharp gleam was seen, changing color from sharp red to orange, gleam which came from a lenticular object evolving at low altitude above the road. This object took altitude while accelerating. As soon as it disappeared, all became normal again. They indicate as sources the newspaper "L'Aurore" for October 22, 1954, the catalogue by Jacques Vallée, "Black out sur les soucoupes volantes" by Jimmy Guieu, page 228, and "A propos des S.V." by Aimé Michel page 224. "A man and his son, 4 years old, coming from Charbonnières [sic; Cherbonnières] suddenly felt painful tickling, similar to those produced by an electrical shock; the child started to cry. The intensity of the pain increased as the car advanced until the sudden stopping of the engine and the extinction of the headlights. They were dazzled by a powerful red light which changed to orange; it emanated from an object which evolved above the road." They say then that nothing or almost nothing in this text corresponds so what the witness told. He allots the fact of having stalled, and the feeling of heat, unimpressive, which he felt to the emotion and surprise at the passage of a phenomenon that he describes as brief, very fast, a luminous body with a trail of light. The Belgian ufologist indicates that in France, on October 21, 1954, a man suddenly felt painful prickling similar to electric shocks and his 4-year-old child started crying. They felt increasing pain as the car went on, and suddenly the engine died and the lights went off. They were blinded by a strong red light, which turned orange. It came from an object hovering above the road, and everything returned to normal when it went away. The source is indicated as case 300 of the Vallée catalogue. A glowing red mass positioned itself over a road near Pouzou, in the department of Charente. In the distance an auto approached. At the wheel was a resident of the town of Cherbonnieres on his way to Pouzou. A passenger in the vehicle was the driver's young son, a three-year-old. The driver noticed the red mass up ahead, and as his auto got nearer and nearer, a prickling like an electrical shock swept over his body and kept increasing in intensity. The young child evidently felt the same pain because the toddler began to act up. Soon after the auto's headlights went out and the engine stopped turning over. Once the auto lost power, it rolled to a stop. The red mass down the road turned an orange color and emitted a blinding brillance. Suddenly the strange object vanished and at the same time the auto's headlights and engine returned to normal operation. 187. The Belgian ufologist indicates that in 1954, on October 21, in France, in Pouzou "At 09:30 p.m., a man coming from Cherbonnières (Charente Maritime) accompanied by his 4 year old son suddenly felt painful tickling, while the child started to cry. The intensity of the pain increased until the sudden stopping of the engine of the car and the extinction of the headlights. They were then dazzled by a powerful red light emanating from an object moving above the road." The sources are given as "L'Aurore, 22 oct 1954"; "Jacques Vallée: 'Chronique des apparitions ET' - DENOEL 1972 - COLL. J'AI LU - p. 288"; "Michel BOUGARD: "Des S.V. aux OVNI" - SOBEPS 1976 - p. 215". 09:30 p.m.: In Pouzou (France), 1 man and his son (4 year old), coming from Charbonnières, suddenly feel painful prickling, similar to those produced by an electrical shock, the child starts to cry. The intensity of the pain increases as the car advanced, until the sudden stopping of the engine and the extinction of the headlights. They are blinded by a powerful red light which turned orange, it emanated from an object which moves above the road. A son as the object disappeared, all becomes normal again. The sources are indicated as "L'Aurore, October 22, 1954". 1954 - Pouzou, Charente-Maritime, France. At 9:30 p.m. a man from Cherbonnieres who was driving between Serifere and Paille suddenly felt painful pricklings similar to electric shocks and his 4-year-old child started crying. They felt increasing pain as the car went on, and suddenly the engine died and the lights went off. They were blinded by a strong red light, which turned orange. It came from an object hovering above the road, and everything returned to normal when it went away. (Sources: Aime Michel, Flying Saucers and the Straight Line Mystery, p. 204; Richard Hall, The UFO Evidence, p. 74; Jacques Vallee, Passport to Magonia: A Century of Landings, p. 236-237, case 300; Michel Carrouges, Les Apparitions de Martiens, p. 129; Gregory Falla, BUFORA Vehicle Interference Report, p. 8; Mark Rodeghier, UFO Reports Involving Vehicle Interference, p. 4). Luc Chastan indicates that in the Charente Maritime in L'Eglise d'Argenteuil on October 21, 1954 at 21:30 hours, "a motorist and his son (three years old), coming from Cherbonnières (17) drives on the D220. Near Pouzou, they feel on the body tickling similar to electric discharges that increase as the vehicle advances. The child starts to cry. The car's engine stops and the headlights die out. At the same time, a sharp gleam is seen, passing from the sharp red to the orange color. It comes from a lenticular object moving at low altitude above the road. This object takes altitude more and more quickly while accelerating. As soon as it disappeared, all becomes normal again." The website indicates that on 21 October 1954 at 21:30 in Pouzou, France, "An object was observed. Electromagnetic and physiological effects were noted. One object was observed by two male witnesses on a highway briefly." The sources are indicated as Guieu, Jimmy, Flying Saucers Come from Another World, Citadel, New York, 1956; Michel, Aime, Flying Saucers and the Straight-Line Mystery, S. G. Phillips, New York, 1958; Bowen, Charles, The Humanoids: FSR Special Edition No. 1, FSR, London, 1966; Vallee, Jacques, Computerized Catalog (N = 3073); Vallee, Jacques, Preliminary Catalog (N = 500), (in JVallee01); Vallee, Jacques, Anatomy of a Phenomenon, Henry Regnery, Chicago, 1965; Vallee, Jacques, A Century of Landings (N = 923), (in JVallee04), Chicago, 1969; Cramp, Leonard G., Piece for a Jig-Saw, Somerton, Isle of Wight, 1966; Schoenherr, Luis, Computerized Catalog (N = 3173); Carrouges, Michel, Les Apparitions de Martiens, Fayard, Paris, 1963; Hall, Richard H., The UFO Evidence, NICAP, Washington, 1964; Flying Saucers, Flying Saucers Magazine, (Palmer); Rodeghier, Mark, UFO Reports Involving Vehicle Interference, CUFOS, Chicago, 1981; Falla, Geoffrey, Vehicle Interference Project, BUFORA, London, 1979; Hatch, Larry, *U* computer database, Author, Redwood City, 2002. 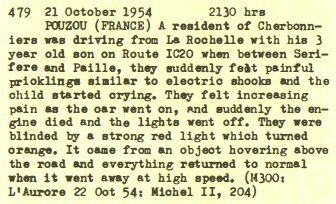 The website indicates that on 21 October 1954 at 21:30 in Pouzou, France, Motorist and child felt shock and heat, motor and headlights failed; then luminous UFO became visible ahead of car". And: "Pouzou, France. Between Serifere and Paille, a man from Cherbonnieres suddenly felt painful pricklings similar to electric shocks and his 4-year-old child started crying. They felt increasing pain as the car went on, and suddenly the engine died and the lights went off. They were blinded by a strong red light, which turned orange. It came from an object hovering above the road, and everything returned to normal when it went away." And: "Between Serifere and Paille, a man from Cherbonnieres suddenly felt painful pricklings similar to electric shocks and his 4-year-old child started crying. They felt increasing pain as the car went on, and suddenly the engine died and the lights went off. They were blinded by a strong red light, which turned orange. It came from an object hovering above the road, and everything returned to normal when it went away." And: "An object was observed. Electromagnetic and physiological effects were noted." And: "One orange-red object was observed by two male witnesses on a highway briefly." The sources are indicated as "Vallee, Jacques, Computerized Catalog (N = 3073); Vallee, Jacques, Challenge to Science: The UFO Enigma, Henry Regnery, Chicago, 1966; Vallee, Jacques, Preliminary Catalog (N = 500), (in JVallee01)". (143) Oct. 21, 1954 - Pouzou, Charente-Maritime, France. At 9:30 p.m. a man from Cherbonnieres who was driving between Serifere and Paille suddenly felt painful pricklings similar to electric shocks and his 4-year-old child started crying. They felt increasing pain as the car went on, and suddenly the engine died and the lights went off. They were blinded by a strong red light, which turned orange. It came from an object hovering above the road, and everything returned to normal when it went away. (Sources: Aime Michel, Flying Saucers and the Straight Line Mystery, p. 204; Richard Hall, The UFO Evidence, p. 74; Jacques Vallee, Passport to Magonia: A Century of Landings, p. 236-237, case 300; Michel Carrouges, Les Apparitions de Martiens, p. 129; Gregory Falla, BUFORA Vehicle Interference Report, p. 8; Mark Rodeghier, UFO Reports Involving Vehicle Interference, p. 4). Vallee Case 300 citing L'Aurore 22 October 1954. A source without reference says that on October 21 in Pouzou, a man and his 4-year-old son, coming from Charbonnières, suddenly felt painful pricklings, similar to those produced by an electrical shock. The child started to cry. The intensity of the pain increased as the car advanced, until the sudden stall of the engine and the extinction of the headlights. They were blinded by a powerful red light which changed to orange, it emanated from an object which evolved above the road. As soon as the object had disappeared, all became normal again. Pouzou, not "Souzou", is in the territory of Les Eglises d'Argenteuil, 17400, and a little more than 10 kilometers by the D220 road coming from Cherbonnières. Paille exists, Sérifère is unknown. [---] Article in the national newspaper L'Aurore, Paris, France, October 22, 1954. [--] Article in the regional newspaper Centre-Matin, France, page 10, October 23, 1954. [am1] "Flying Saucers and the Straight-Line Mystery", book by Aimé Michel, English version of "Mystérieux Objets Célestes", S. G. Phillips publisher, USA, page 204, 1958. [ni1] "The UFO Evidence", book edited by Richard Hall, NICAP, USA, Section VIII, page 74, 1964. [cr1] "Piece for a Jig-Saw", book by Leonard G. Cramp, Somerton publishers, U-K., 1966. [cr2] "Piece for a Jig-Saw", book by Leonard G. Cramp, Somerton publishers, U-K., 1966. [am1] "Mystérieux Objets Célestes", book by Aimé Michel, Seghers publisher, France, pp 270-271, 1969. [jv1] "Passport to Magonia - On Ufos, Folklore, and Parallel Worlds", book by Jacques Vallée, Contemporary Books publishers, USA, pp 236-237, 1969. [ld1] "Réenquêtes 1954", list in the ufology magazine Lumières Dans La Nuit (LDLN), France, #118, page 4, June 1972. [jg1] "Black-Out Sur Les Soucoupes Volantes", book by Jimmy Guieu, Omnium Littéraire publisher, France, page 228, 1972. [jv4] "Chronique des Apparitions Extra-Terrestres", French translation of "Passport to Magonia", book by Jacques Vallée, J'ai Lu publisher, France, page 288, 1972. [ou1] "La 'paralysie' - synthèse provisoire des recherches entreprises par l'équipe G.A.B.R.I.E.L. ", article in the ufology magazine Ouranos, France, Nouvelle Série #1, page 9, 4th quarter 1973. [jv3] "Anatomy of a Phenomenon", book by Jacques Vallee, Tandem publishers, U-K., page 130, 1974. [jv2] Summary by Jacques Vallée in "En Quête des Humanoïdes", book by Charles Bowen, French translation of "The Humanoids", J'ai Lu publisher, page , 1974. [---] Sensationalist magazine Official UFO, USA, February 1976. [mb1] "Des Soucoupes Volantes OVNI", book by Michel Bougard, Jean-Pierre Delarge - SOBEPS publishers, France, page 215, 1976. [fr1] "OVNI, Premier Dossier Complet des Rencontres Rapprochées en France", book by Michel Figuet and Jean Louis Ruchon, Alain Lefeuvre publisher, France, page 194, 1979. [---] "Vehicle Interference Reports", by Geoffrey Falla, BUFORA, U-K., page 8, 1979. [lc2] "UFOs and Anti-Gravity: Piece for a Jigsaw", book by Leonard G. Cramp, Adventures Unlimited Press publishers, U-K., page 216, 1997. [lg1] "The Fifth Horseman of the Apocalypse - UFOs: A History - 1954 October", monography by Loren E. Gross, USA, page , 1991. 1.0 Patrick Gross December 23, 2009 Conversion from HTML to XHTML Strict. First formal version. Additions [mr1], [go1], [lc1], [ud1], [ud2], [dc1]. 1.1 Patrick Gross January 12, 2010 Addition [jb2]. 1.4 Patrick Gross July 3, 2010 Additions [jv3] [lc2]. 1.5 Patrick Gross July 17, 2010 Additions [us1]. 1.6 Patrick Gross October 25, 2014 Additions [ni1]. 1.7 Patrick Gross November 28, 2016 Additions [er1], [jv2], [ld1], [ub1]. 1.8 Patrick Gross December 14, 2016 Addition [lg1]. 1.9 Patrick Gross February 11, 2017 Additions of the Summary and the two maps. Explanations changed, were "Not looked for yet." 2.0 Patrick Gross December 25, 2018 Additions [ou1], [pr1], [mf1], [lh1], [pr2].